It’s fall in Mississippi, and it’s one of my favorite times of the year. Football is in full swing, which tends to cause great havoc to my heart rate, and due to my loyalties to the hometown rival, can create a hostile work environment on the occasional Monday. It’s also the season for freaky weather. On a recent weekend I arrived in Oxford, Mississippi, one of my top three American cities, only to be greeted by a ninety-plus degree afternoon. The next evening I was wearing a heavy coat. (Huh?) Fall may also be the best season for Sunday drives. As I typed this, The Wife was at the wheel (she not only edits, she chauffeurs when I have a deadline). Fall colors are beginning to creep into the treeline, cotton fields are snowy white, and the ruddy orange of the sweet potato crop is beginning to emerge from the soil. 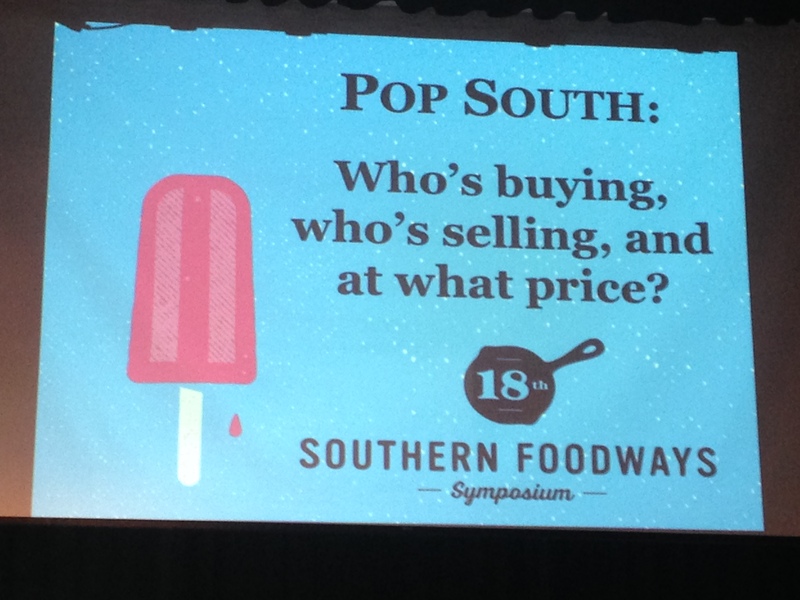 For me, however, the pinnacle of autumn is the Symposium of the Southern Foodways Alliance. The Symposium has many layers. It is in part an academic conference. The SFA is housed within the Center for the Study of Southern Culture at the Ole Alma Mater, and among other staff there is a professor devoted to the study of Southern foodways. Some of the lectures we hear are condensed versions of dissertations and scholarly articles presented by Ph.D.’s. Peel away another layer, and you find a family reunion. Chefs, restaurateurs, food writers, grocery store owners, and folks who are simply fascinated by all things culinary, all get together for this long weekend because – well, we just like being around each other. It’s also very much about the meals. Even the most celebrated, James Beard Award-winning chefs are equally thrilled and filled with dread at the prospect of feeding this crowd. There are nine meals that fill the weekend, and each has its own story. We shall commence with breakfast. Breakfasts at the Symposium are usually standup, casual and often served in brown bags, but that doesn’t mean any less work goes into them. 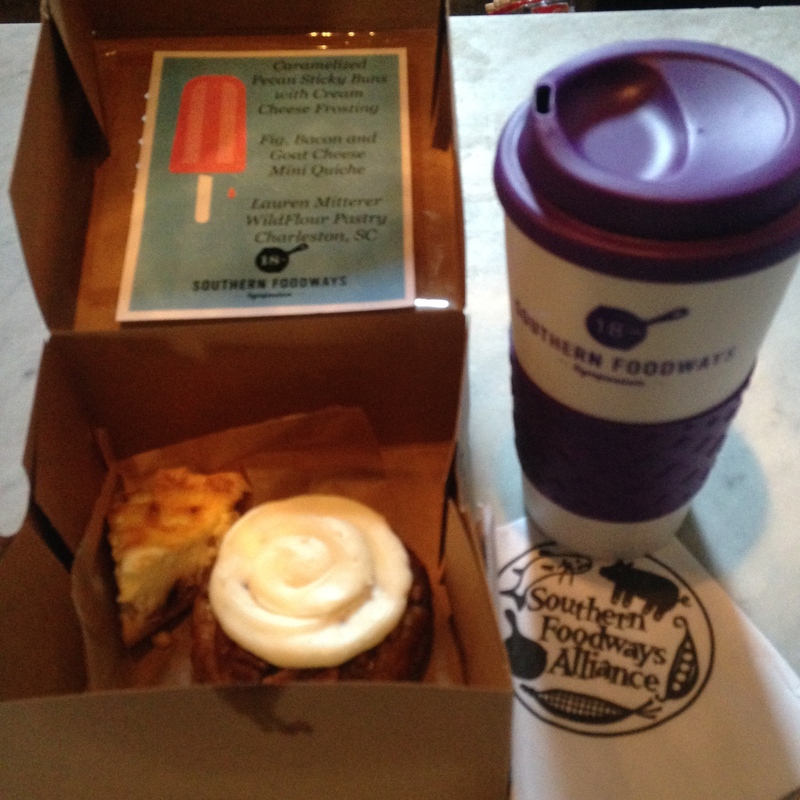 On the first morning of the conference we arrived at the historic Lyric Theater to a bevy of brown breakfast boxes filled with the creative baking of Lauren Mitterer from WildFlour Pastry in Savannah, Georgia. The eye-catcher was a caramelized pecan sticky bun with cream cheese frosting. This was no wimpy little hint of glaze, like one might smear on a canned cinnamon roll. It was a thick swirl of white, crowning crunchy pecan halves, with the sticky bun serving as a solid foundation. Though I generally maintain a take-it-or-leave-it opinion when it comes to pecans, these were crunchy enough to provide a nice textural contrast between the copious icing and the sticky sweet roll. Slightly more savory was the fig, bacon, and goat cheese mini-quiche in another corner of the box. My relationship to goat cheese is off-again, on-again – it tends to be a stronger flavor than I can generally embrace. But in this pastry, the sweet fig and briny bacon worked well with the hint of sour-umami that the goat cheese delivered. The second morning found us break-feasting outside on a campus lawn, with the early morning temps re-assuring us that fall might actually be coming. A table full of brown bags awaited the crowd, this time filled with kolaches. I occasionally see kolaches advertised in our area, but my first taste was in Central Texas, where Czech settlers likely introduced them many years ago. In my brief acquaintance with kolaches, I’ve seen them in basically two forms. They may look like a buns or rolls filled with breakfast meats of some sort, similar to a pig in a blanket. The other iteration has a bite similar to a cinnamon roll with a dollop of fruit or cheese filling on top. Our bags had one of each, brought to us by Ryan Pera and Morgan Weber of Revival Market in Houston, TX. The meat-filled kolache was laden with spicy boudin sausage (boudin in a blanket?) saving me the need for the saltine crackers I normally use as a vessel for breakfast boudin. They called the other one a Satsuma kolache, which had a cream-cheesy filling flecked with bits of Satsuma mandarin. The Wife went back for another one of those, and I did my part to help her make it disappear. One of the speakers on Saturday talked about Cracker Barrel. The theme of the weekend was “Pop Culture: Who’s selling, who’s buying, and at what price?” and there is a lot of pop culture at Cracker Barrel. According to her research, the fine folks at the Barrel essentially invented the Hash Brown Casserole. For breakfast on the final morning, Chef Corbin Evans of the Oxford Canteen reinvented it. 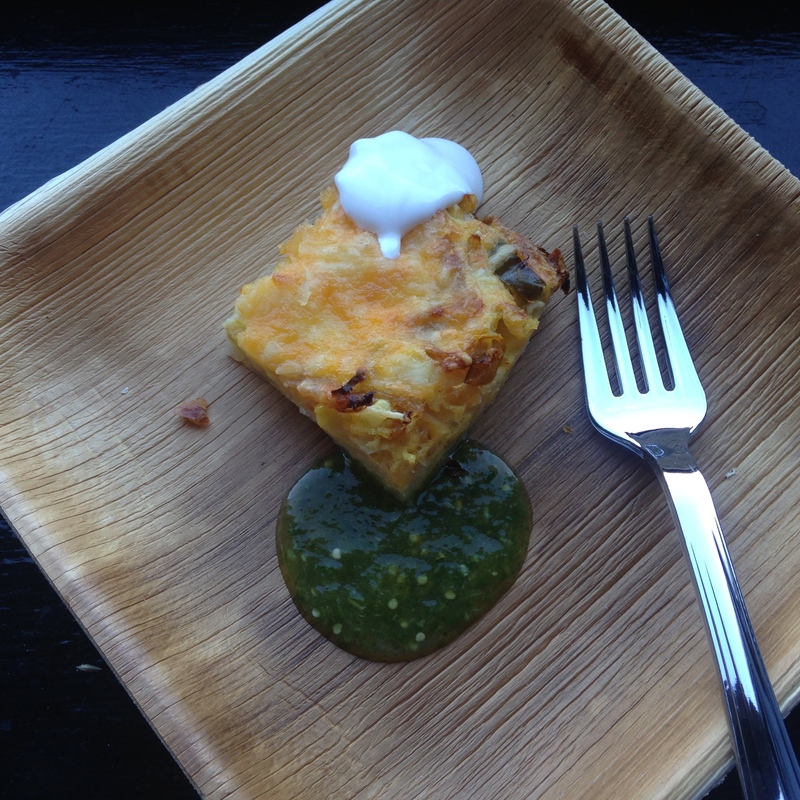 He called it Skillet Hashbrown Breakfast Taco Casserole with Salsa Verde and Crema (not in a brown bag or box, but on recyclable brown plates). I am not what you would call a frequent flier at Cracker Barrel. But if they had any part in the inspiration of this Latino version, then I am at least deeply thankful. The food may change every morning, but there is one consistent factor: Royal Cup Coffee. In our home kitchen we have a collection of coffee tumblers that the Royal Cup folks provide for Symposium attendees each year. We pretty much wear them out. Over the years they have added the option of pour-overs, and an espresso-fueled truck. (Okay, that’s an embellishment – but you can get espresso drinks from the truck.) This year they also added a nitrogen-infused cold brew. I usually prefer my coffee sweet and creamy, but this cold brew didn’t need any add-ons. I was astounded and amazed. And after two of them, very much awake. Stay tuned; lunch is coming. 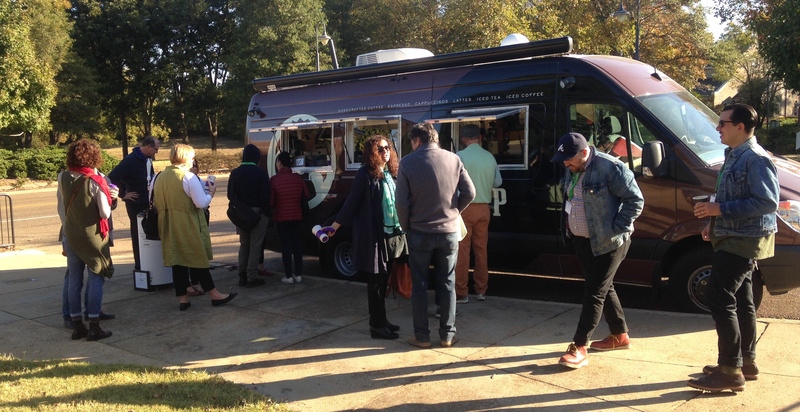 If there’s one thing I like about attending the Southern Foodways Alliance Symposium every year, it’s the nine meals we get to eat between meetings. Oh – and the snacks. Don’t get me wrong; the between-meal lectures are off the charts. The combo factor is what keeps me coming back. But if it were just these nine meals (and the snacks) I’d probably keep coming. 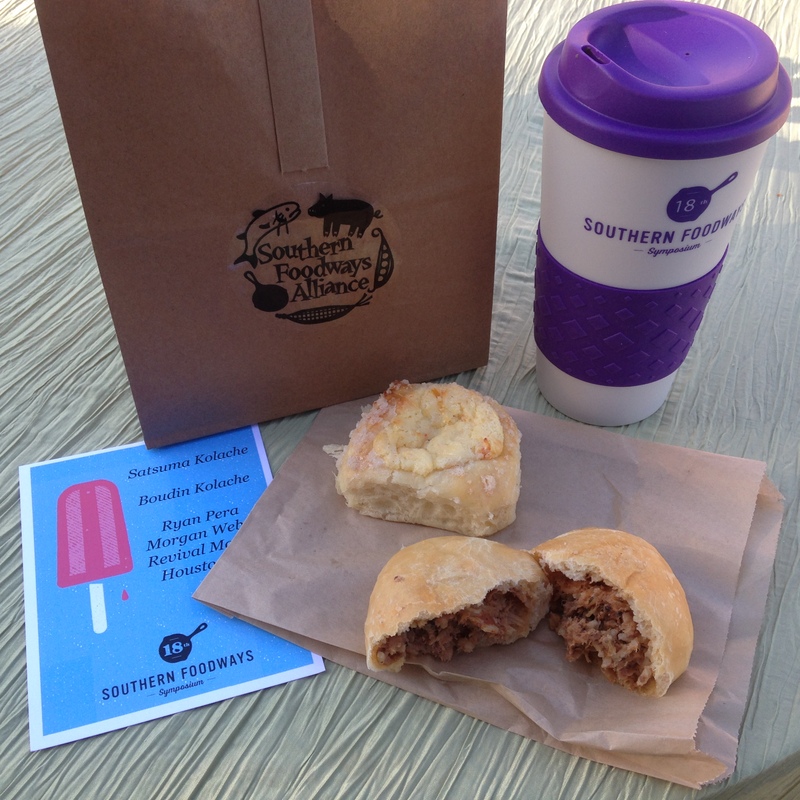 We began our first full day of the 2014 Symposium with Royal Cup coffee and a brown bag breakfast prepared by Cheryl and Griffith Day of Back in the Day Bakery in Savannah, Georgia. The bag was heavy with apple spice crumb cake and a sweet potato and sausage hand pie, a nice complement of sweet and savory. 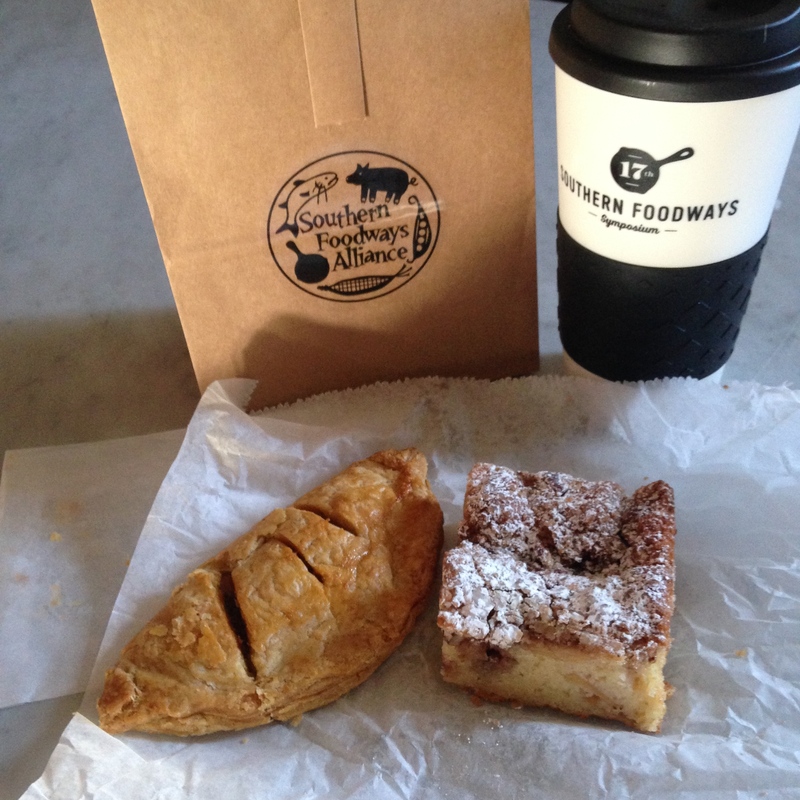 The hand pie made me sorry I don’t get to Savannah more often, but glad that we live near Vardaman – the sweet potato capital of the world. The apple cake was the kind of good that makes you want just one more bite, then just one more bite, and so on till you’re miserable or it’s gone or both. I ate all mine and a little bit of The Wife’s, since she listens when her tummy tells her it’s full, and I … well, I listen less. 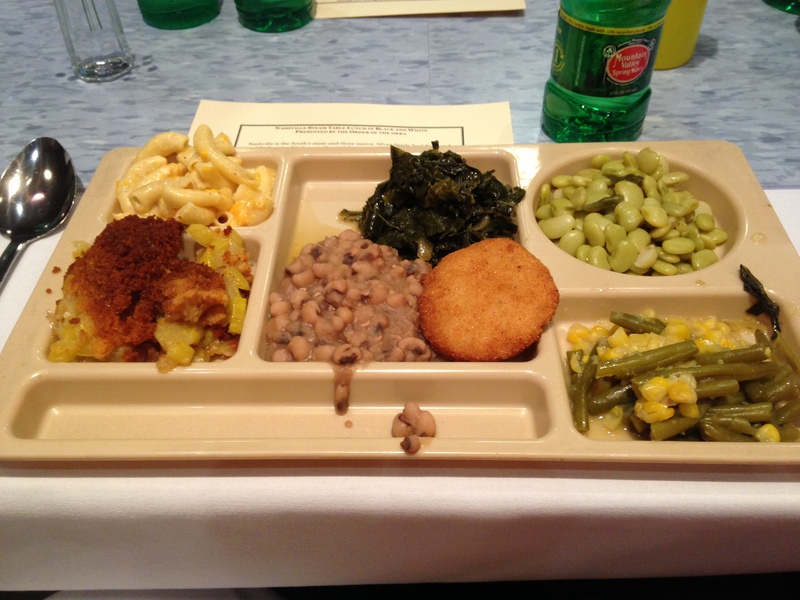 The noon meal that day was called the Nashville Steam Table Lunch in Black and White. For reasons I’m not sure can be fully explained, Nashville has become famous for meat-and-three style lunch spots, or as those of use who indulge in that sort of thing like to call it: comfort food. Kahlil Arnold of Arnold’s Country Kitchen and Sophia Vaughn of Silver Sands Soul Food were our guest comforters that day. Kahlil brought squash casserole, corn-crowned green beans, collard greens and banana pudding. The squash had a little bit of sweetness in it that I could really appreciate. The banana pudding had a lotta bit of sweetness that I also really appreciated. Sophia started us off as we waited in line with little discs of hot-water cornbread, then we got helpings of bitty baby lima beans, macaroni and cheese, and black-eyed peas. So it wasn’t really meat-and-three I guess, but I was plenty delighted with my pudding-and-six, with a side of cornbread, thank you very much. Comfort food can be a little messy – but don’t worry, I cleaned the plate. The Friday night dinner at the symposium is the traditional catfish feed at Taylor Grocery, featuring Simmons Farm-Raised Catfish. The meal itself changes very little from year to year, and for that we are thankful. What varies are the small plates served in front of the restaurant that whet our appetites. In previous years we have had all manner of things at these outposts, but this year it was all about Delecata. 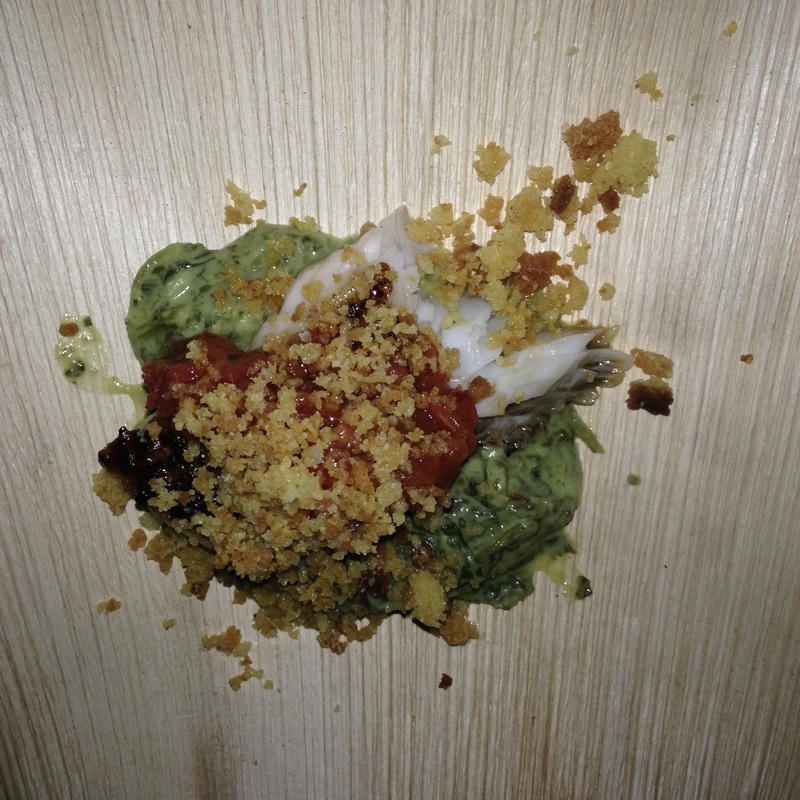 The Delecata cut is what Simmons calls a “prime cut” of catfish: skinless, boneless, hand-filleted and deep-skinned. Others have called it “the filet mignon of the pond.” Charles Phan of The Slanted Door (and more) in San Francisco gave us a riff on a catfish spring roll – Mississippi catfish with a California spin. Ashley Christensen of Poole’s Diner (and more) in Raleigh, NC, took that prime cut, brined it, seared it, glazed it somehow with smoked ham hock, put it over creamed turnip greens, topped it with roasted tomato relish, and garnished it with cornbread crumbs. This is not your Aunt Ruth’s filet mignon. Somewhere under that other goodness is some catfish. On Saturday night it was the Lodge Cast Iron Beans, Greens and Cornbread feed. We like our cornbread at the SFA, can you tell? “Make Cornbread, Not War” – that’s what the hat says. Beans and greens may sound simple, but I’ll let you decide. Our cardboard trays were loaded with four variations on the theme, all from Georgians. From Eddie Hernandez of Taqueria del Sol (Atlanta): Charros, Turnip Greens and Green Chile Cornbread. Duane Nutter of One Flew South (also Atlanta) gave us Gulf Drum and White Bean Stew with Shrimp Acaraje’ (a black-eyed pea fritter.) Whitney Otawka (the one Athens representative) of Cinco y Diez, featured the Brazilian side of things with Carne Seca (a dried beef), Linguica (a sausage) and Lengua (yep – it’s tongue) with Feijoada (Brazilian stew) Sauce. 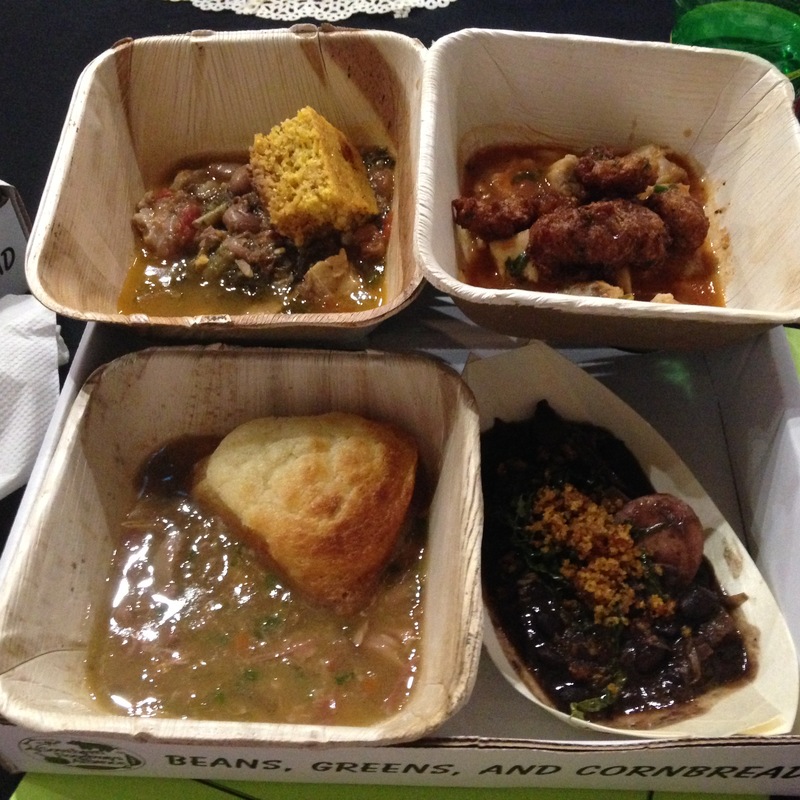 Kevin Gillespie, chef at Atlanta’s Gunshow (the restaurant, not the firearms sale), had Heirloom Bean and Fatback Soup with Puffy Cornbread, probably my favorite cornbread of the night. We puffy people like puffy food, I guess. Four beans, four breads, four goodness’ sake. Dessert that night and a surprise afternoon snack came to us all the way from New York City. 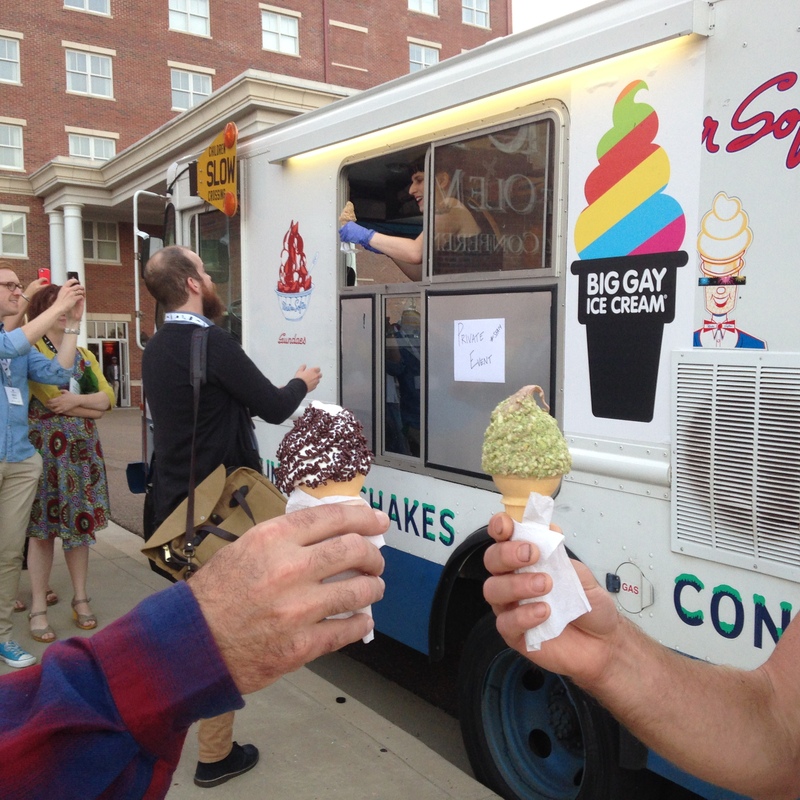 The Big Gay Ice Cream truck took a tour through a handful of Southern cities on it’s way to Oxford, where they passed out their special soft-serve, dipped in unique things like Nilla wafer crumbs and Wasabi pea dust. Our collective sweet teeth were satisfied in the evening with a choice of Coconut Ice Cream with Amarena Cherry Swirl or Dirty Banana with Crushed Nilla Wafers and Dulce de Leche. You know which one I got firsts and seconds of. “Just say no” to coconut. But yes, I dig homemade banana ice cream. Our final brunch was preceded by the usually unusual blend of the arts. While we ate Corbin Evan’s Bacon-Egg-Cheese Bread Pudding, we listened to Repast, an oratorio commissioned just for the symposium, focusing on Booker Wright, a waiter at Lusco’s in Greenwood back in the 60’s. Following that, logically, we ate the Greenwood Steak and Shrimp Brunch, led by Stevens Flagg, David Crews and Taylor Bowen Ricketts, all of whom do food right in their own way in the Delta. 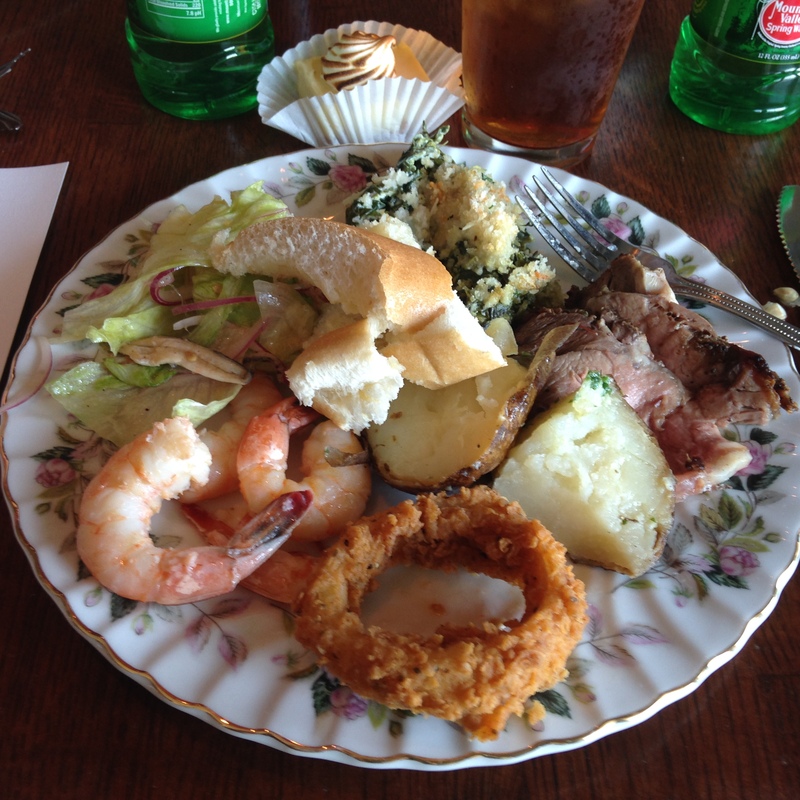 If you’ve ever been to Lusco’s or Giardina’s, you might recognize the flavors: Gulf Shrimp in Butter Sauce, Drenched Salad, Fried Onion Rings, Spinach and Oyster Madeleine, Baked Potatoes, Roasted Black Pepper-Crusted Rib Eyes, and Lemon Pie. Both the oratorio and the meal were a fitting tribute to Mr. Wright and the menu he used to sing. It’s over. Sigh. Time to start saving dollars and calories for next year.